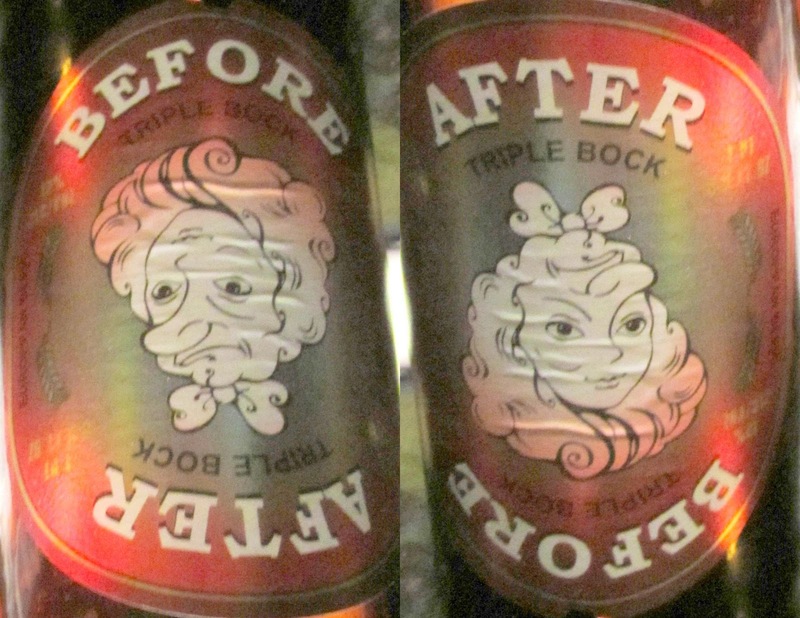 All the hullabaloo at Beervana over the label for Upright's bottles of Four Play reminded me of a beer label I spotted a few months ago at Belmont Station, this "Before-After Triple Bock", which turns out to be from a Lithuanian brewery called Rinkuškiai. 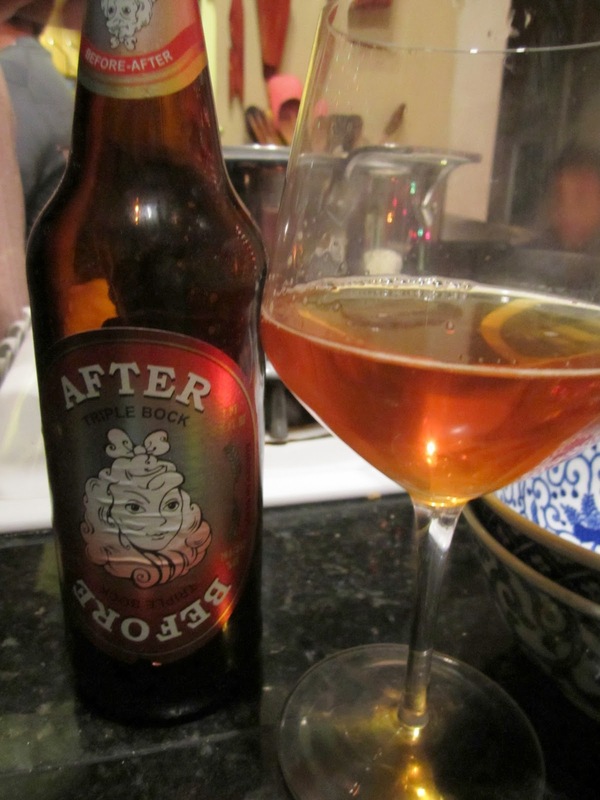 It didn't cost much, and I didn't have much hope for an allegedly 12% ABV Baltic bock that I'd never heard of, but it I figured the somewhat humorous nature of the label made it worth a couple bucks. See how pretty the girl is after you drink this beer? You should have seen her beforehand (see the side-by-side picture at the bottom of this post). Talk about beer goggles. 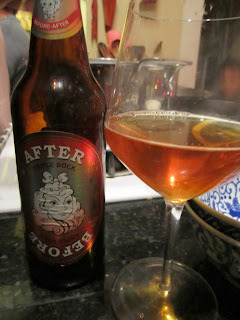 The beer was pretty bad, by the way: syrupy and one-dimensional. Dave described it as: "Like syrup from canned fruit cocktail with fluorescent cherries". It gets a generous "C" on Beer Advocate. Back to Ezra's label for this year's Four Play. Commenters at Beervana and the New School have complained that the painting of a partially undressed woman on a couch objectifies women. Good lord. It's a stylized piece of art, and while I think the artist has portrayed an attractive, fit young woman, it's not necessarily a seductive pose. She might be waking up with a hangover, for all the picture conveys. To the complaint that the label panders to "stereotypical hyper-masculine, heterosexual males", Ezra replies that there is no indication of masculinity or heterosexuality in the picture at all: "the lack of presence of a male could mean the opposite". 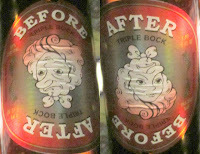 To my mind, the Before-After label is more offensive than the Four Play label. It's a clever drawing, and good for a titter or two, but it sends an even bleaker message about women than Ezra's pin-up art. First, it says that a woman is only interesting if she has a particular kind of youthful beauty. A second implication is that if you can just get drunk enough, you'll be ready to hook up with any woman. But look, even though I said the label was more offensive than Four Play's, it's not worth throwing a snit about either one. Lighten up, people. Next you'll be complaining about the St. Pauli Girl (this year's is a trained architect and kick-boxer who speaks five languages and is developing her own make-up line!). Judging from the website, Rinkuškiai markets a much more staid image in Lithuania. But trolling the internet I found a couple more labels where they strive for prurience in strange and ineffective ways: Lobster Lovers Lager and Werewolf Dark Ale. One more thing. Why is it that, in a town full of beer lovers, any little glitch is greeted with a chorus of "Boycott!"? In case people don't click through, let me underline the fact that your quote about hypermasculinity came from comments, not me. And I agree: you want objectification, try Atlanta's Red Brick Brewing and their odious advertising. I would turn your final question around: In a town with so much good beer so readily available, why wouldn't people avoid breweries or bars who act in ways they find objectionable? kevin: You have a good point, there's so much here that I don't have to waste my time on something I don't like, for whatever reason (e.g. calling dried hops "fresh"). What was bugging me is the hair trigger Portlanders seem to have for calling for a mass boycott. Though now that I skim back through the comments on the two posts, no one is doing that in the case of Upright, they're just saying why they'll avoid it themselves. So I exaggerated, but "dog bites man" doesn't sell pageviews. Didn't someone mention that they know people who won't go to Burnside Brewing because of their logo? What, are there people who are offended by forest nymphs with tails, or human-cat hybrids, or whatever the hell that is? Some people are just looking to be offended. Hip Chicks Do Wine has a blend called Drop Dead Red, and the label is very similar in concept to Upright's Four Play label--a stylized picture of an attractive woman wearing red lingerie while reclining on a couch. Yet I would argue that the Hip Chicks are pretty strongly targeting women as consumers. Tangentially, Geoff at Bailey's told me that while they had Boneyard's "Girl Beer" on tap, one of those hypermasculine types came in and asked for "the lightest thing on tap". He then proceeded to become offended when Geoff recommended the Girl Beer. It's just a name! But that's a great story about the Girl Beer. I can't wait to have one. I think I'll order it with a Croque Madame. Oh, I'm not a fan of Hip Chicks' label either (or their wine--definitely blah). It's blah no matter who their intended customer is. I'm not skipping the beer out of some PC protest, but I'll be the first to say that the label is bad, that it's not 'art', and that it doesn't do justice to the Upright brand. I just don't think that the label is any good from an artistic perspective. I've seen the same type of stuff on airbrushed t-shirts at the flea market or on a velvet painting at the thrift shop.